I have never tasted port wine before. Friends told me it is very expensive but very nice to drink as it is sweet. So, out of curiousity, I Google around to look for information on port wine and its origin. I wanted to find out why it is so expensive. Someone bought a $400 bottle of port wine and bragged about how precious that bottle is. With the amount of information available on the internet, it is easy to dig out information I need. Port Wine originates from Portugal. And according to this site, port wine need not be that expensive as what my friend boasted. Port wine found on this site costs around the region of $100 and less only. However, there are those with vintage years like 1960s that costs more than $300. I hope someone gives me a bottle of port wine as Christmas present because I am really interested to have a sip of it. According to sources, the wine is very ‘grapey’ and many of the wines were described as fruity with hints of chocolate, cinnamon and etc. That sounds like the kind of flavours I loved. 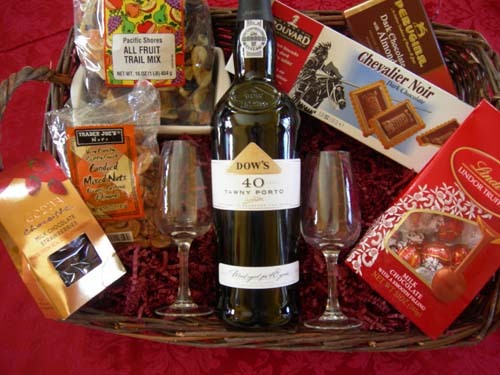 The site selling port wine gave some food pairing suggestions and I noted that port wine goes well with fruits and nuts. Meanwhile, white port goes with Sushi, Clam Chowder, Fish Cakes, Smoked Salmon, Spicy Prawns, Duck/Chicken Liver Pate, Cheese Biscuits or Canape with an assortment of any seafood. Now, that is really something I must try at least once. Maybe I should just go get myself a bottle of port wine and celebrate, whatever the occasion is. Port is considered “fortified wine,” which means that additional alcohol is added to the wine after fermentation, which stops all additional fermentation and makes the wine sweeter and stronger. Port is typically around 20% alcohol by volume, whereas most wine is from 9-14%. There’s bad port and there’s good port. The bad stuff is sickly sweet and cloying; the good stuff is like thick brandy, with a multitude of flavors and where the sugar doesn’t remain in the mouth after a drink. The good stuff is the more expensive, needless to say.